Then get tough, mentally tough! It takes more than muscle, more than practice, more than sheer determination to get to the top. It takes the mind of a champion! 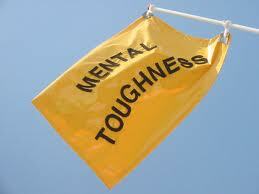 Mentally toughness is learned, not inherited! You maintained a pre-dominantly positive healthy and optimistic attitude. You accepted full responsibility for today, what you did and what you didn’t do. 1) Self-motivated and Self-directed, it comes from deep within. 2) Positive but Realistic. Your eyes allways fixed on success, on what can happen, and on what is possible. 4) Calm and Relaxed under Fire. It is another opportunity to explore the outer limits of your potential. 5) Highly energetic and ready for action. You are capable of getting yourself pumped up and energized for playing your best, no matter how you feel or how bad or meaningless the situation. You are your own igniter and can do so inspite of fatique, personal problems or bad luck!